The Hanwei Albrecht hand and a half sword was one of this companies first forays into the market for medieval swords. And it seems that the research that went into it paid off as it has stood the test of time.. So let's take a much closer look with 'Shooter' Mike Harris, who put this sword through it's paces for 8 months to see if it really does go the distance. There are several reviews and discussion threads on Sword Buyer's Guide and SBG Forum regarding the Hanwei/Paul Chen Hand-and-a-half sword that is sometimes referred to as the "Albrecht II Sword." It is a rough copy of the XVIIIa.1 "The Sword of Albrecht II" from Oakeshott's typology. JPFranco originally posted a review on the main SBG site. His review was responsible for motivating me to buy this particular sword as my second functional medieval sword. Many thanks, JP. This is a follow-up to those initial reviews. The subject of this write-up has been used intermittently for the last 8 months and is starting to show the signs of age. So I thought it might be interesting to see how it's holding up to the use, and in some cases, abuse. The blade is roughly an Oakeshott Type XVIIIa, but without any trace of hollow grind. It tapers to an acute point that is thick through the cross section which provides for a very stiff blade. 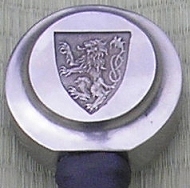 There is hardly any wobble experienced when the pommel is struck forcefully. The edge was not particularly sharp in factory new condition, and required more sharpening before it could be put to good use. One attractive element of the blade is the laser engraving of a Passau "Running Wolf" marking and a daisy or marigold stamp on each side, in the fuller near the guard, which are similar to markings found on the original sword. The grip is very well executed, and consists of a spongy leather wrap over three cord risers. The risers are positioned at each end and at the point just behind the lead hand. They provide a very secure grip that is both comfortable and provides excellent control of edge alignment. The very large round pommel looks a little out of place on this sword, but it is true to the original. It is hollow and cast of a very hard stainless steel alloy. A very detailed imprint of rampant lion is cast into each side. At only 7 inches long, the guard appears a bit small for a sword of this size, but again, it's true to the original design. The guard is also cast of the same extremely hard stainless steel alloy. All Hanwei western medieval swords come with a nicely made scabbard. Most are leather covered with metal chape and throat. The scabbards for the Albrecht swords are typical of the line. The lines are clean and straight. The blade fits the interior of the scabbard well, with no rattling or movement. But the sword draws smoothly and without any binding. But so much for the technical stuff. My real questions were "How does it handle and perform?" and "How durable is it?" My "Albrecht" was purchased in October of 2006. I don't even remember where I bought it, but it was probably where ever Paul said to. Shortly after acquiring it, I started reading Bill Tsafa's website and just had to build my first tire pell. So, armed with my Albrecht and equipped with a tire pell, I set about testing how durable this sword was at the same time I was taking the first baby steps into learning a small bit of western swordsmanship. The Albrecht took a large part of the brunt of that training (really just a lot of fumbling around). During the course of these activities, the Albrecht probably made 1,000 strikes on the tire pell. One of the things that really impressed me was it's ability to cut little chunks out of the tire treads. This is a cut-n-thrust sword with an emphasis on the thrust. The point is narrow and there is very little blade mass ahead of the center of percussion. Yet it cuts amazingly well. In fact, it cuts so well that it was a frequently companion when launching my early attacks on neighbouring vermin...i.e controlling the rabid proliferation of plastic bottles and overhanging tree limbs in my region of the kingdom...the Duchy of Mikeness. 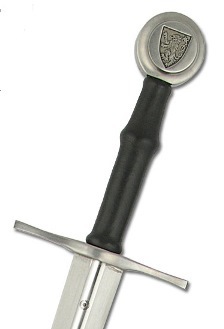 The Albrecht has been my most frequently used trainer for half-swording and thrusting. This is where the design really shines. It fully penetrates truck tire sidewalls with not a lot of effort. As a thruster, it shines as the point control is good. Here is a photo showing its penetration capability on a tire sidewall with a single-handed thrust. As a cutter, it's good. I wouldn't rate it as great, but good is accurate. If I could change two things about it to make it handle better, I would like a little more "belly" to the end of the blade for cutting and I really wish the pommel were smaller. The overly large pommel give be a bit of trouble with cutting and edge control. But overall, I think it is a good sword and handles well. So how's the Albrecht doing after all this abuse? Well, after having the blade flats re-polished a dozen times, and resharpening and edge touch-up probably 2-3 dozen times...it looks like this. The blade has a few nicks from hitting the steel belting in tires and a few other things. You can notice that the grip shows significant signs of wear. The leather is scuffed and quite worn on the high spots where the risers are located. And it still seems to work well for me. This video was taken July 21, 2007... out takes and all. I usually conclude my reviews by asking "Would I recommend this sword to someone else?" Anyone who's read this far doesn't even need to ask the answer to that!